I know what you're talking about. Thanks for the heads up. Yeah, the story is shorter in the "new" game. 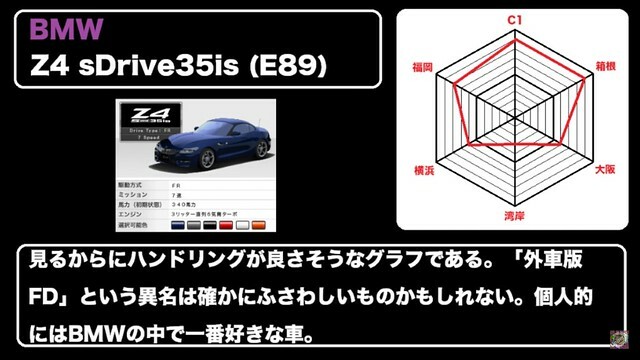 60 as opposed to 80 in Wangan Maxi 2 and 3. If I start from a discard, it's half the length of the aforementioned games which is cute. 100 stories is a lot. Never had 3DX+ where I live. But yeah, discards are cool. Can't wait to drive the M1. I'll have it with a nice Orange colour, with fries and a drink! I use an M1 almost every time I play. The handling can throw you off at first because the rear swings out more upon entering corners; fortunately, it gets more tolerable near the exit. I find it more fun to use than an FD, esp. for those 830 HP battles. I'm currently at 12'06"085 with it on Metro Tokyo compared to 12'06"511 with FD, and 9'10"533 (M1) vs 9'10"793 (FD) on Metro Kanagawa. Although it's already FDU'd, I'm still doing shuttles to get that Devil Z stamp; I'm currently at killer whale stamp. About time it sheds its "underrated" status. Easier said than done when you're the only non-JDM player in roughly 95 percent of your MT sessions. Has anyone tried out the 2002 Turbo? More fun than the FD to ya. Sounds like a fun car to me. Thanks for your input. Hats off to you for achieving those times too. Love to see more people using this car in the game. 20 games away from fully tuning my M6 (Arcade closes early during weekdays rip). I feel like with it's weight, you really don't want to slide it since the speed loss seems hueg. so its not "heavy" ? Counter-Burn Tactics needs to be that evil/devious to work... the fun part is to take advantage on curves/technical areas... which on straight line is harder to beat those burners.. 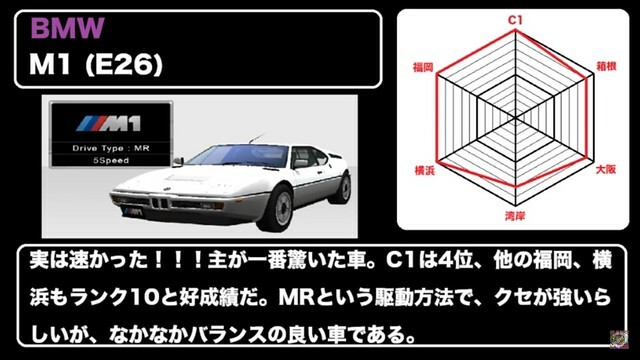 I found a video wherein a Japanese player FT'd the cars and gave out graphs for each of them. The M1 (by the time he made this video) made 4th in C1 TA rankings while the rest it's around the top 10. It is that good. He simply states that it's the "Foreign version of the FD" in terms of handling. It's the BMW preferred by many. Z4 very nimble and grippy, can confirm. I wonder what the Works sticker for the Z4 would be like..... Wouldn't be surprised if it were a BMW Motorsport one. I see. Thanks for the feedback. Will definitely make my Z4 a Ghost hunter once I FT it. The story is almost done.